In 1893 Mr Malcolm of the Bungalow, Gourock, was steward of the St. John's Masonic Lodge "Firth of Clyde" no. 626. William M Brown, Old Glasgow Tavern, Gourock. Coins Cascade from a Bell's gallon collecting bottle at the Ashton Hotel, Gourock, where customers donated a grand total of £113. Help by Len Jeyes, Bell's area representative, the bottle is smashed open by Hugh Lindsay, chairman of the Greenock Branch for Cancer Research. 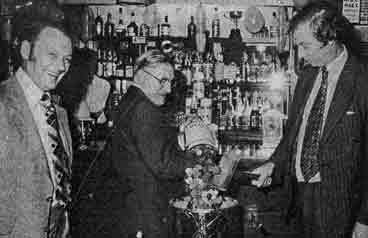 One left showing his appreciation, is Mr. Ian Johnston, proprietor of the Ashton Hotel. 1979.